Patio furniture offers you a great opportunity to beautify a home’s exterior surface or even extend its use. 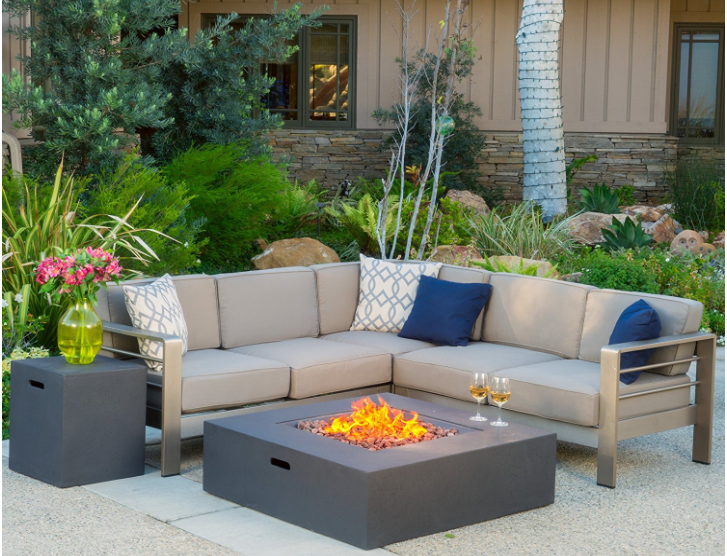 Modern patio furniture with fire pit is an ideal choice for providing warmth and convenient illumination for outdoor spaces. The fire pit gives a gentle touch and creates a warm environment perfect for outdoor entertainment. 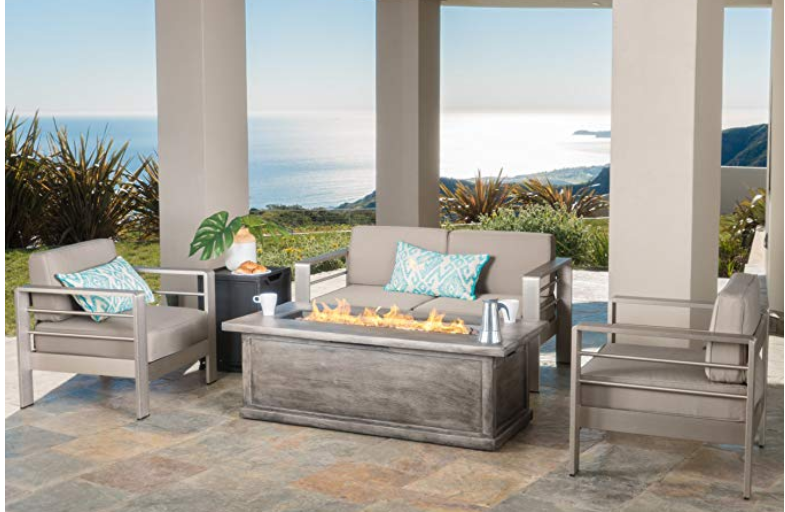 We take a look at the top 10 patio furniture with fire pit that is ideal for any modern living space. This is a unique modern chair with an eye-catching design that provides your home with taste and functionality. 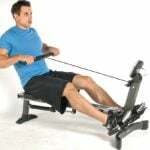 It comprises a right arm two-seater, a left arm two-seater, a corner seat, a fire table, and a tank holder. The material used for the sofa is aluminum while a water-resistant fabric has been used on its cushions. The composition of the fabric is 100 percent polyester. The MGO material has been used to make its grey colored fire table. This is a 6-piece woven lounge from Hanover that offers a perfect relaxing opportunity for your home. It comprises two armchairs, one loveseat, two ottomans, 40,000 BTU fire pit table, and four accent pillows. It features generously-sized cushions and hand-woven frames that create a resort-style environment in the comfort of your home. The center burner has been provided with an elegant red fire glass that motivates the people to sit around the table. 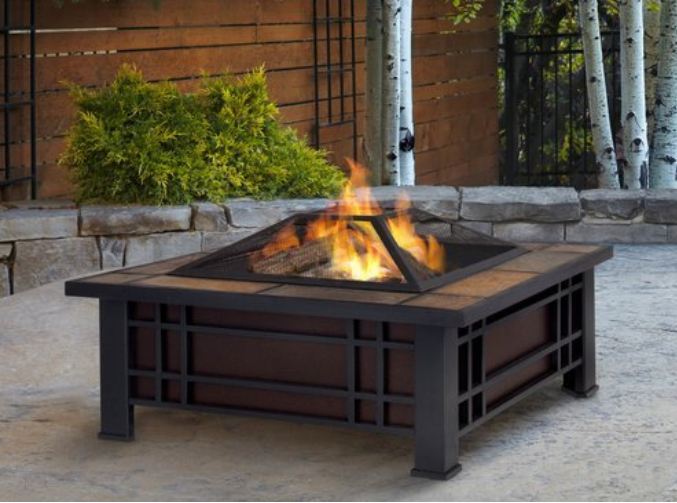 This is a rectangular fire table with an elegant and distinct fire feature that compliments well with any outdoor living space. 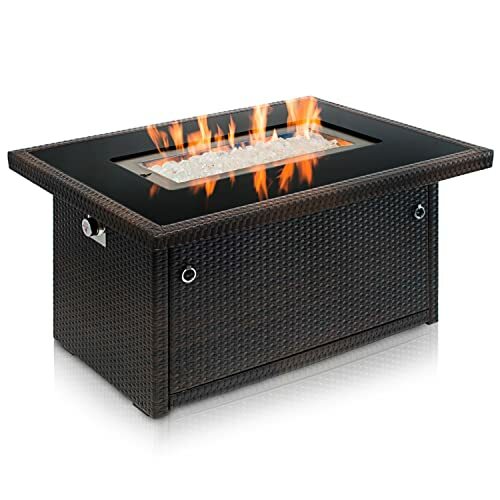 It has a high quality 35,000 BTU propane fire pit that provides the required warmth all year round. A black tempered glass tabletop and an Arctic Ice fire glass enable you to enjoy the view of the dancing flames as you warm yourself around this table. It has been made from long-lasting and rust resistant materials. This includes aluminum construction for the frame and coffee colored UV HDPE wicker. 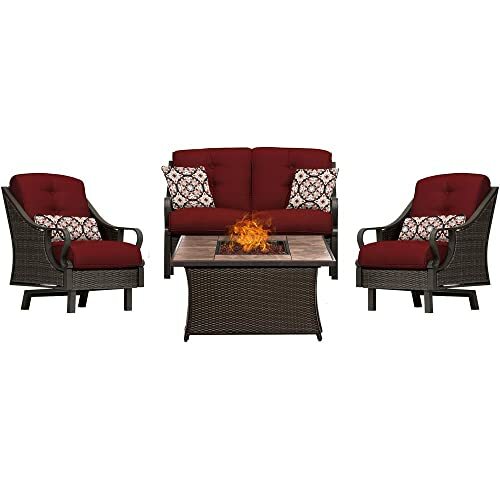 This is a tranquil 4 piece chat set from Hanover that includes everything needed to make an outdoor retreat section in your home. It has one deep-seating loveseat, a fire pit Table, two Rocking armchairs, and 4 accent pillows. 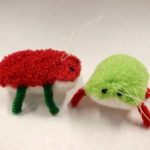 The set offers a perfect setting for having long hours of warm friendly conversation. Each piece comprises hand woven resin straps in its walnut-colored wicker frames. The resin straps have been powder coated to give them rust resistance and all-weather properties. This is a functional and fashionable chat set that has five pieces in its collection. This includes a powder-coated steel tabletop and four cushioned chairs. The chairs have a decorative detail at the back while the cushions have a designer touch button-tufted back. The cushions are self-reversing, comfortable, and easy to clean. The table comes complete and has a fire poker and spark guard. 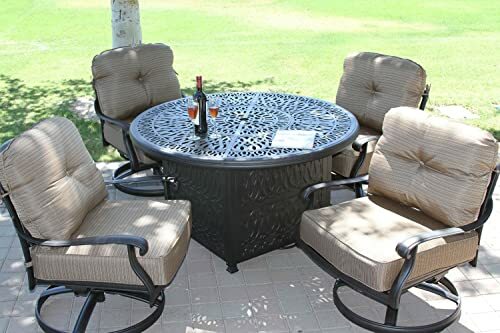 This is a nice-looking dark bronze patio set that boasts of having a timeless design. The collection contains four deep seating swivel rockers and a 52-inch round table. The swivel rockers come with back and seat cushions and both comfortable and elegant. A 15-year limited warranty is provided for the frame. 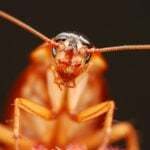 The purchase is also covered by a 5-year warranty period for any manufacturer defects. This is a fashionable coffee table and club chair set that can be used to create an ideal outdoor oasis. It features a finely-woven wicker and a water-resistant fabric that can withstand toughest conditions. It comprises 4 club chairs and a stylish fire pit table. The table uses the MGO material while the club chairs use the aluminum material in their construction. 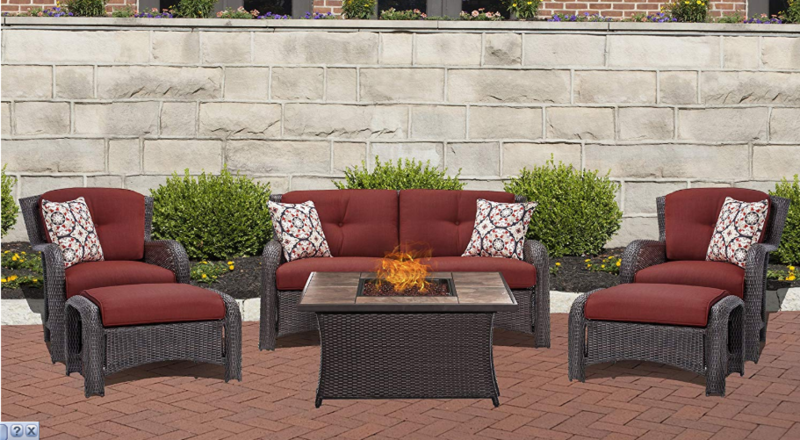 This is a cozy four-piece set that comes with a 56″ fire pit table. It has a sturdy design that is quite impressive in any outdoor space. Some of its features include plushcushions, heated fire table, and water-resistant fabric. The set has two chairs, a loveseat, fire table, and a gas tank holder. The chair is constructed using aluminum material while the cushions are covered with a waterproof fabric. 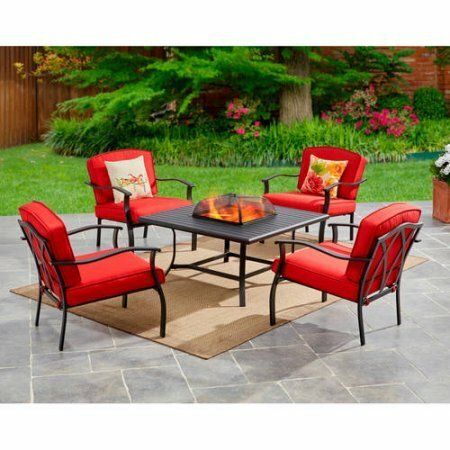 This is a premium patio furniture with a fire pit that can help in burning seasoned wood. The set looks attractive and has a consistent slatted design. The set comes with a log poker tool and a spark screen. It is weather, heat, and fade resistant and hence able to serve you long. Patio furniture is a great acquisition for any home owner. Acquiring one with a firepit makes it even more ideal as it creates a conducive environment for sharing memorable and happy moments with friends and family all year round. There are many options for patio furniture on the market that you can choose from. Before choosing one, you need to consider factors like purpose, size of the living space, shape, and type of patio furniture. 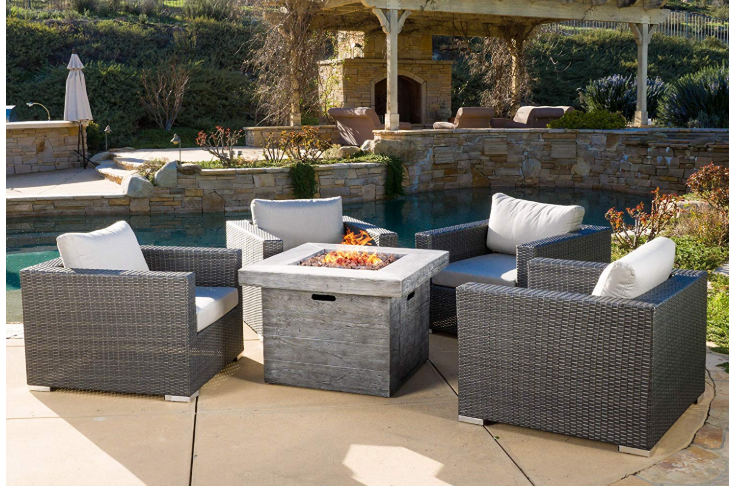 In this article, we have explored the top 10 patio furniture with firepit that suits your need.